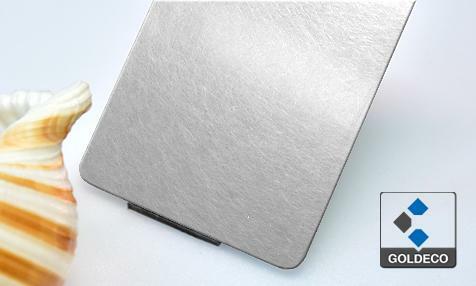 Goldeco Stainless Steel is a top-ranked trustable and reliable decorative stainless steel vibration finish sheets supplier, manufacturer and exporter in Foshan China, supplying prime quality stainless steel sheets in ASTM/AISI/SUS/GB standard grade 201, 304, 430, 316L. 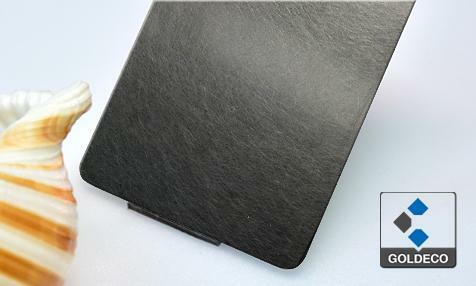 Vibration is a multi-directional finish, or non-directional satin finish. it has a uniform texture with random distributed, multi-directional brushed lines. Advanced machine has been adopted to ensure the surface uniform consistency and being checked by one by one before protetive film was laminated . It is a nice choice for architectural uses, especially those places have cosmetically demanding. Vibration can be used on wall panels, elevator cabs, wall clading, and trim. depending on the useage, it can be done over mirror finish, and can be coated with anti-fingerprint coating for interior decoration use. Do you want to know how much does a 4x8 sheet of vibtrated stainless steel cost? Do you want to know where you can get the best price and buy the quality vibtrated stainless steel sheet? Contact us, and we are ready to offer you our quality products and fast delivery service. Furthermore, we offer sheet metal fabrication service, send us your detailed drawings, our professional staff will get back to you with our solution and costs.